The Patchsmith: Zakka Rag-Ribbon - Don't do it my way! Zakka Rag-Ribbon - Don't do it my way! UPDATE: I have retitled this blog - Don't do it my way. Linda from I finally have time has come up with a great solution to all the threads. It is to cut the strips on the bias. Check out her blog about it here. What a clever lady she is and her ribbon looks so lovely. I would still recommend you check out the notes below regarding the finished length of ribbon. But hey - all it needed was some lateral thinking - doh!!! 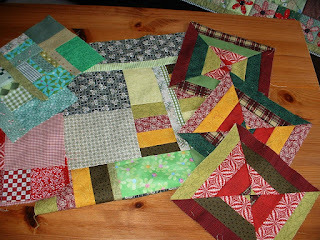 If you have yet to start project 16 on the Zakka Style Sew Along I have only one word for you - DON'T! Melody Miller's project looks enticing and quaint but it is the final sentence that is the real indicator that this just may not work - "The frayed edges and patchwork really make this ribbon stand out." Actually it makes the ribbon look like a rag. 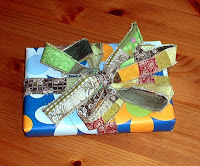 Not only will you spend your time, electricity, cotton and scraps making this project but you will have thread all over yourself, your floor and, if you attempt to wrap a gift, the gift. You will spend as much time trimming the frayed edges and threads as you do stitching the ribbon itself. Unfortunately, this project just didn't work for me. You may be thinking that you haven't got much to lose - after all this project uses scraps after all. I still say - DON'T. There are much better uses for your scraps - make a coaster or place mat, make the leaves ready for Week 24 on the Zakka sew along, make scrappy binding - make anything except rag-ribbon. I already had several patched squares of scraps sewn together so I decided to use one made up of my favourite greens. I followed the instructions for the 'narrow ribbon' and cut the patched square into 1" wide strips. If you are determined - as I was - to complete as many of the Zakka projects as possible then note that section 5 of this project instructs you to sew strips together "until you achieve the desired length." I believe this should read "until you achieve twice the desired length" because the next paragraph instructs you to fold the ribbon in half matching the short ends. This will half your constructed length. I also cut the ends of my ribbon on the diagonal thinking it would make a neater finish - but in all honesty, nothing is going to make my ribbon look neat. If you do persevere and complete this project I would ask - when will you use it? Put it on a friend's gift and that friend will think you have lost your marbles - especially when they unwrap the gift and they have threads all over the place. They will be envisaging you sat somewhere, looking slightly crazed, hair unbrushed, mumbling to yourself whilst sewing together small pieces of fabric so that it looks like a rag!! Maybe it is me - maybe it just didn't work out for me. Melody's ribbon looks so neat. However, I did notice that the pictures in the book have been zig-zag stitched AND overlocked along each edge (look particularly at the large picture on page 76) - that is a huge amount of machine time and cotton. In my opinion you should save yourself some time and energy and pop down your local fabric store to purchase some wonderful, pretty, purpose-made ribbon. Never mind - it is a learning curve. Can't sit chatting any longer, I've gotta go and hoover up the threads all over the sewing room floor! It might work if the edge was bound by a pretty binding, or ribbon, possibly. But it still seems like a lot of work and a lot of resources. I don't mean to be disparaging about it and look forward to other people's comments/blogs regarding this project. I hate waste though and couldn't help but think 'I could be making scrappy binding with all this fabric'. Thanks! perhaps I'll give this project a miss then!! I made this one yesterday, and I completely agree with your assessment. 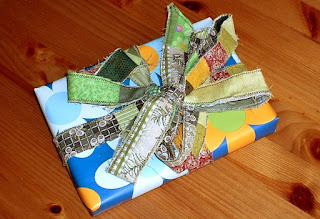 I like the fabric combination I used, and I almost like the finished ribbon, but I wouldn't dream of putting it on a gift. Way too messy. I like your fabric combinations. I was sewing along thinking 'oooh I like this fabric ..... oooh I like this one ...... I remember this one ......" but the finished product didn't work. I've had what might be a brilliant idea about this project! 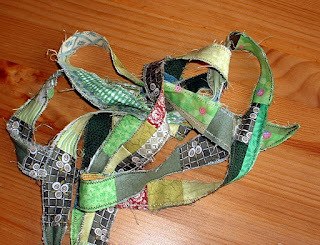 What about making the "big wonky patchwork block of scraps" and then cutting it into strips on the BIAS and sewing those together end to end to make the ribbon? Wouldn't this eliminate all the frays without doing a lot of edge stitching???? I guess that it would also be rather stretchy. Does that matter? I also cut my bias strips twice as wide as I wanted the finished ribbon. Then I matched up the long edges (not the short ends) and zig-zagged the edges to trap the frays (this way I didn't lose ribbon length). The first time I made the ribbon, I didn't use starch, which was a huge mistake. The starch (I use that Mary Ellen Best Press stuff) makes the ribbon soooo much better. It's like I tell my customers--the first is the worst. The second time you make something it always turns out much better! That is a great idea Linda. You should post it on the discussion board or try it out and post a blog. Maybe that is where I went wrong. Let me know how it goes. I see you have already done this and it works out great. Nicely done. Thank you for all the tips and your vision on the pattern. I haven't started yet, but intend to make all the projects from the book, so I will give it a try. Not happy with this project at all. Also wondering why it was put in it. Because yes: WHEN will you use it? I am going over to Linda's blog and see what she has to say. Brilliant post! I really love it when bloggers tell it like it is rather than pretending everything is perfect and wonderful. I'm trying to do as many projects from the book as possible - the ones I like anyway so about 50% (missed the Elephant bookmark though! Just didn't have time), but I was planning on giving this one a miss as I thought it looked like a huge waste of fabric. I treasure my scraps! Great post - I know you have edited it but I am now convinced to give it a wide berth. Thanks. Loved reading this post! Sorry to hear it didn't turn out as you'd like, but the image of your friend getting a gift wrapped in this ribbon gave me a chuckle! Oh I am so sorry you had such trouble! I definitely should have rounded up some project testers for that contribution. Your description did make me giggle, though:) I'll bet your ribbon would look great sewn down onto a fabric bag, should you ever make one. It was a learning experience for all of us Melody and we did have fun with it - I enjoyed being reacquainted with some favourite fabrics as I stitched the scraps together and some of the other Zakkarists came up with some truly lovely ribbon. And after all, that is what sewing is all about - playing and learning.